SOCIETY - Food for free? OK, who'd like some free, good quality food? Every year in the autumn there's a plentiful supply of free fruit ready for the taking - and almost nobody wants it or even realises it's edible. Walking home this afternoon I spotted an ornamental pear on a housing estate. The grass beneath the tree was strewn with little pears, ripe but only about 5 cm long and 3 or 4 cm in diameter. They will lie there until they rot, or the birds eat them, or they're carted away with the fallen leaves by the local authority. What a waste! I had an empty shopping bag with me so sorted through them picking out undamaged and unbruised fruit. I imagine I took about a kg of fruit altogether. Back home I gave the pears a good wash and then sliced chunks off vertically, avoiding the cores and rejecting any slices with internal browning. No need to peel them, that would be a tedious job with so many small fruit. I filled a medium saucepan with the washed pieces, added some sugar, and stewed them until they were soft; they created a lovely aroma. Then I took them off the heat and pulped them with a blender. Now to taste some. Ah, they had an excellent pear flavour but were distinctly astringent. They would have made good perry, maybe the tree is a perry cultivar or just a seedling from somebody's discarded pear core. Next I put the fruit in an ovenproof dish and added a crumble topping. 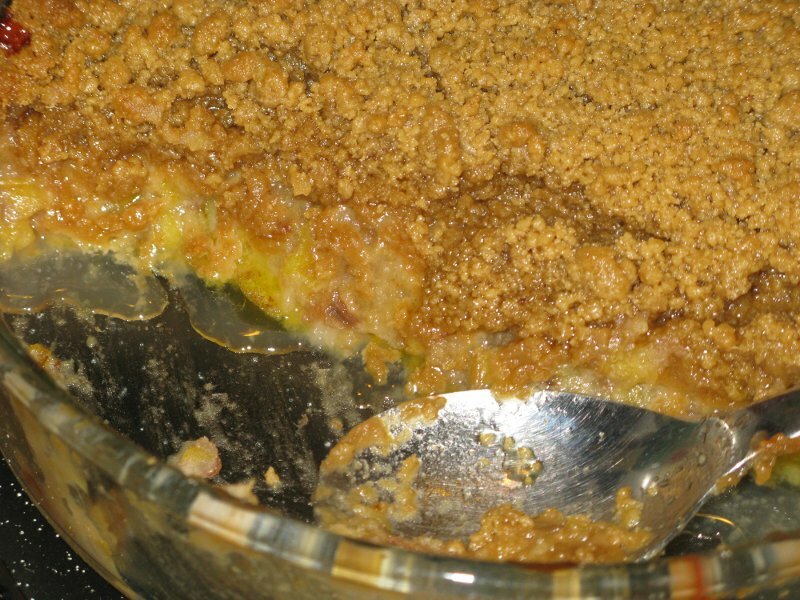 I used brown sugar to make the crumble as it has a nice, rich flavour. The finished crumble went into a preheated oven at 180 C, and thirty five minutes later I removed my pear and date dessert from the oven and made a jug of custard. Not exactly free food I suppose, but at least the pears were free. 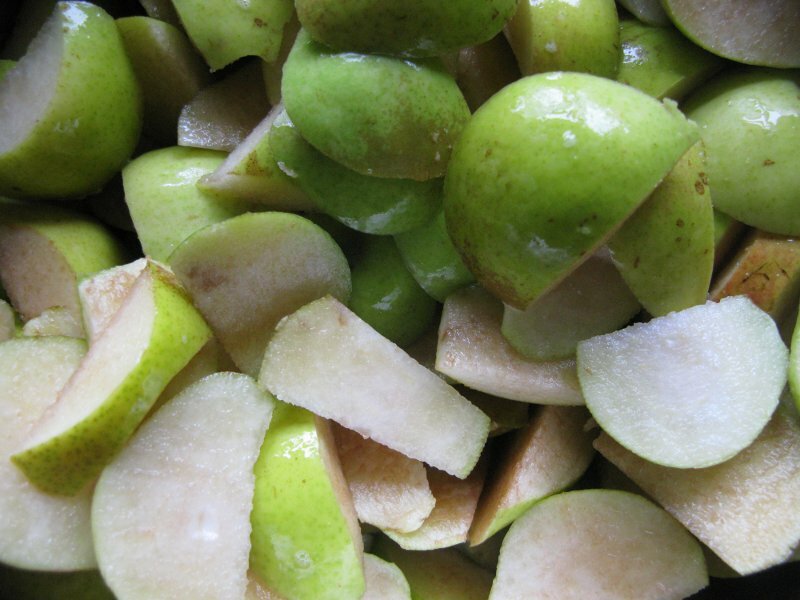 And far more flavour than any pears you could buy at the supermarket. Some people are anxious about food collected in this way, particularly where wild fruits, leaves or fungi are concerned. Providing you are absolutely certain about the identity of the material there is no need to worry. But please - if you are not sure of what you have - don't eat it. 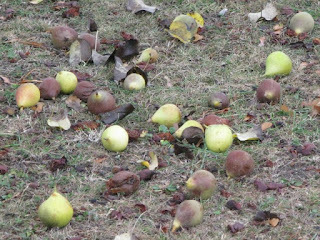 As far as pears are concerned, the shape of the fruit, its aroma, the slighty gritty flesh, the characteristic leaves, the size and habit of the tree - all these are strong clues to identity. This was a form of Pyrus communis and therefore completely safe.